Electric turnout control, about as easy as it gets! As I switch over to Dead Rail (battery powered locos) - obviating the need to climb under the layout to solder feeders - I got to thinking about those Tortoise switch machines lurking beneath. Conventional thinking would still have me climbing under the layout with a soldering iron to connect to the power bus and toggle switches. Why would I want to do that? So I’ve put into practice a method I experimented with years ago, using a small 9-volt battery as an external power source - an electronic switch key if you will. Ignore the wire colours. They mean nothing: I was just using up scraps of wire. The polarity is either one way or the other, and as you will soon find out, that’s really easy to change. Tortoises are stall motors - that is, they are supposed to be under power at all time. That would require connecting them to an under-the-layout power bus. But my experiments have shown negligible creep-back once the power is removed. So I thought it might be feasible to use external battery power. As the late John Armstrong would have said, the method has been “feased”. 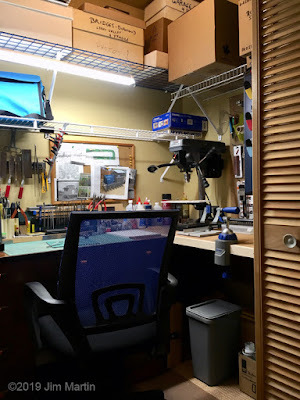 Most of the work can be done at the workbench. For each switch machine cut two lengths of wire and solder alligator clips to one end of each. Cut an electrical gap in a short length of printed circuit tie and solder the other ends of the wires to each side. Glue the tie to the bottom of the facia in front of the switch points you want to control, bend the wires under the layout, and connect the alligator clips to the switch machine’s outside terminals. Don’t worry yet about which wire goes where. Draw arrows on each side of the battery indicating point travel and start testing each switch. If the point travel is contrary to the arrow simply swap the alligator clips. That’s it for the under-the-layout work. A close-up of the printed circuit board tie, glue to the bottom edge of the fascia. As you can see, the contact points on the front of the layout are pretty unobtrusive but I’ll probably improve the cosmetics. I also plan to build a more elegant battery case, one with spring contacts and a DPDT switch to control turnout direction. In the meantime I have an inexpensive and uncomplicated way to operate my switch machines - one that’s stoopid simple. 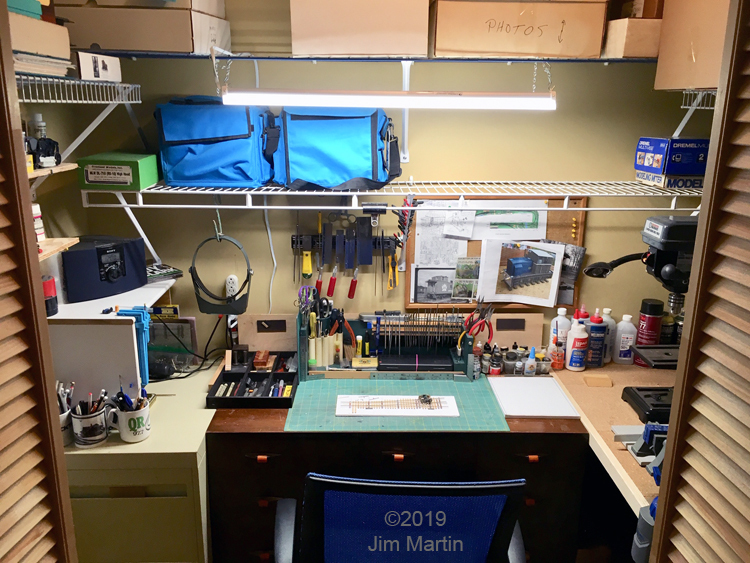 I spent some quality time recently organizing my new, compact workshop. It has been in use for several months on various small projects but it was hastily thrown together during the move into the house. The shelving and primary work surfaces along with pegboard and lighting went into place quite early, but tools and building supplies were not optimally located. So I gathered up all my tools from a variety of locations, spread them out on a table and started sorting. easy reach, can inspire great modelling! In addition to the main work area, I am setting up a secondary work surface inside an old roll top desk. 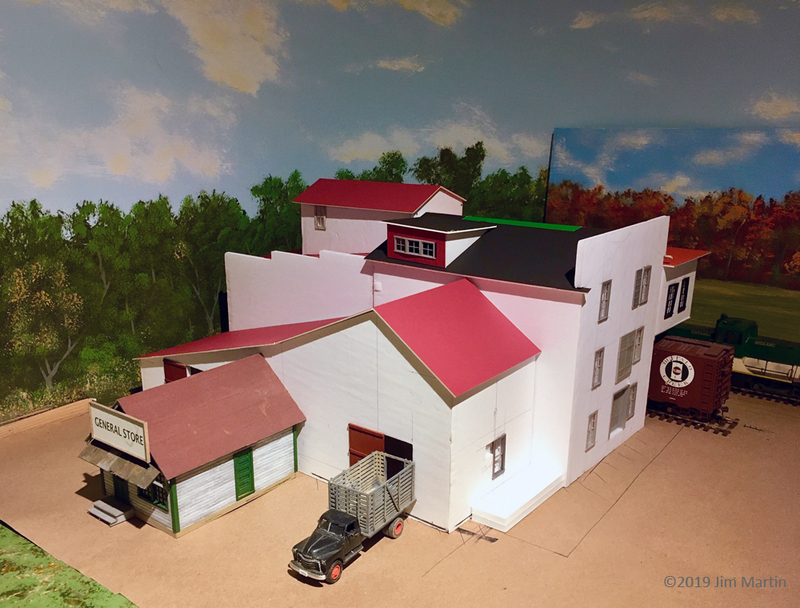 That’s where I will play with plastic models and other lighter projects from time to time to escape the model railroad regimen. I also maintain a travel tool kit for train shows, and another tool kit that I use for my conservator work at the local marine museum. I am well along to acquiring duplicate tools so I won’t have to scurry from tool box to tool box. My chief complaint about the new house is that it’s too perfect. Every square inch of the basement is finished. There is no room to make a mess. There is no utility room as such for cleaning brushes, spaying paint and glue, etc. Thankfully the basement has large closets so I grabbed one for myself. 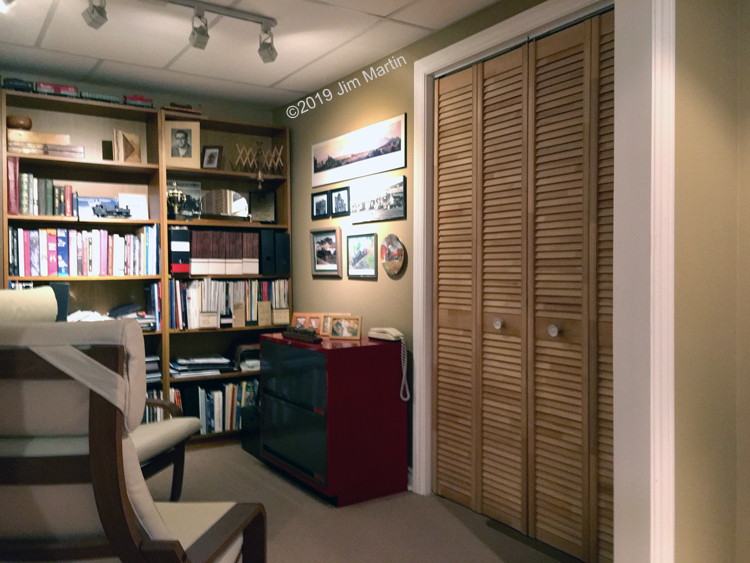 Just off my train library is a seven-foot long by four-foot deep closet with an eight-foot ceiling. The wire shelving was already in place, along with lighting and a handy electrical outlet. 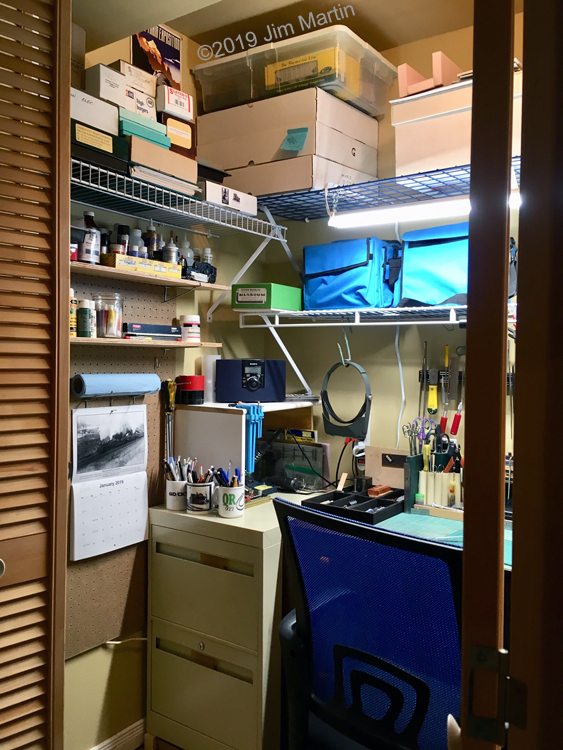 All I had to do was rearrange the shelving, hang a power bar on the wall and move my old filing cabinet and work desk into place. 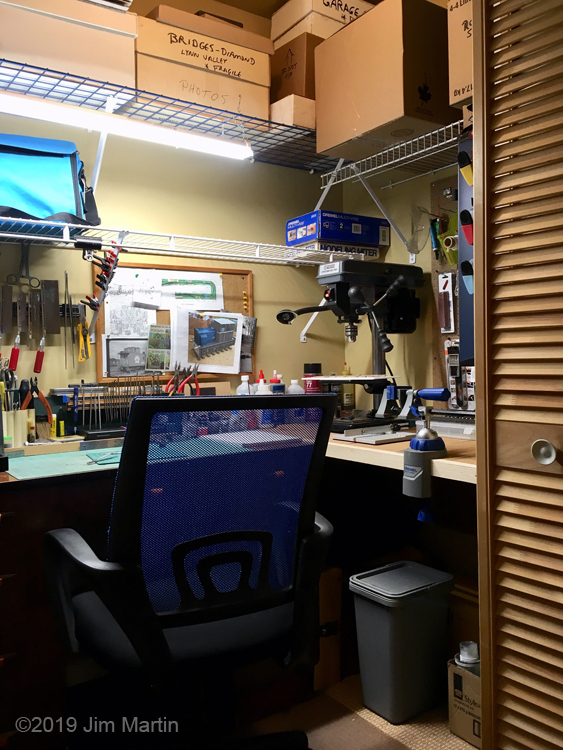 I then built a cork-topped work surface to the right for larger tools, and hung some pegboard. As you can see there is still lots of room on the shelves and on the pegboards for the additional stuff that I will inevitably accumulate. The pictures here show the shop as clean as it will ever be, but whatever mess I make I will be able to hide behind the bi-fold doors and no one will be the wiser. Spray painting of models currently awaits the warmer outdoor weather, or the completion of a portable spray booth. When done I will be able to roll it from behind the layout and into the basement bathroom where it will vent out the window. More on that when I do it. Until next time... happy modelling! 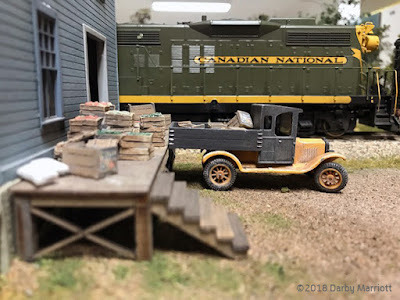 I have been busy building my basement model railroad and working on an article for the NASG Dispatch and one for the CN Lines. For these reasons, I have been lax in posting here. Here are the track plans. So there you have it, a blog about a blog. 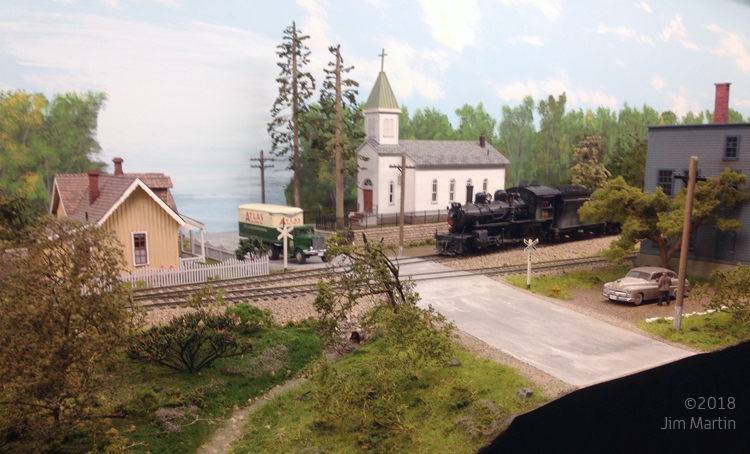 Work progresses nicely as the Port Dover Branch is now fully integrated into its new home. 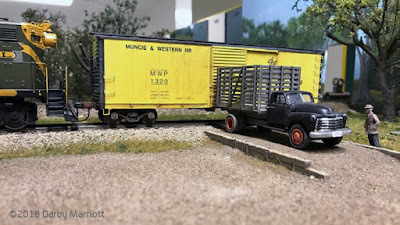 I’m a couple of sections of flex track short of being able to run from one end to the other, but I’m going to pick up a few lengths from Workshop buddy Andy Malette and then I’ll be able to drive the last spike later this month. New Jersey pal Joe Kimber has kindly done a new drawing for me. Here it is, along with the old drawing for comparison. 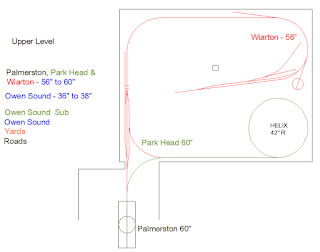 Comparing the two drawings you can see that with one exception - Culverhouse - the principal elements remain in the same order if not along the same walls. 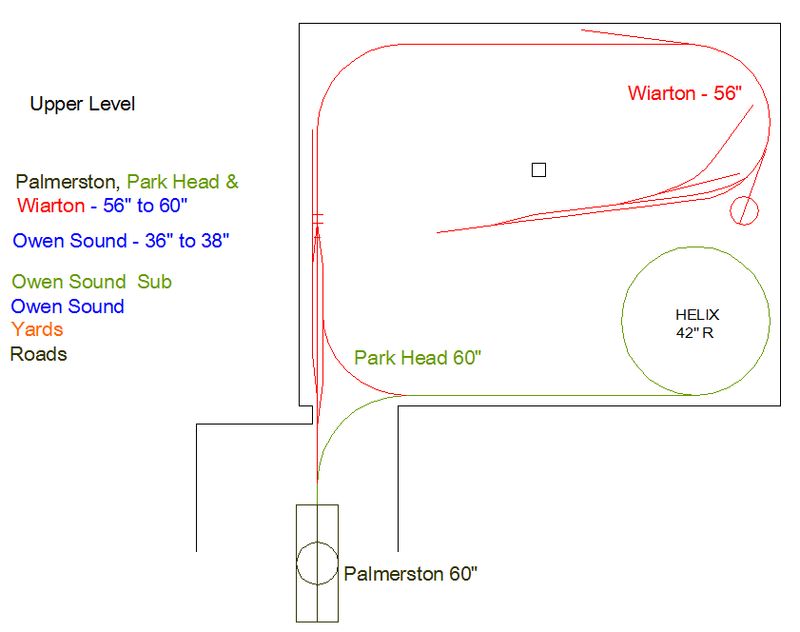 Perhaps I could have put more layout in the new space but as I’ve mentioned earlier it would have crowded the room. That is something I didn’t want. My sense of design requires the layout to compliment the space, not dominate it. Happily Culverhouse is still around and in the capable hands of Workshop member Darby Marriot. 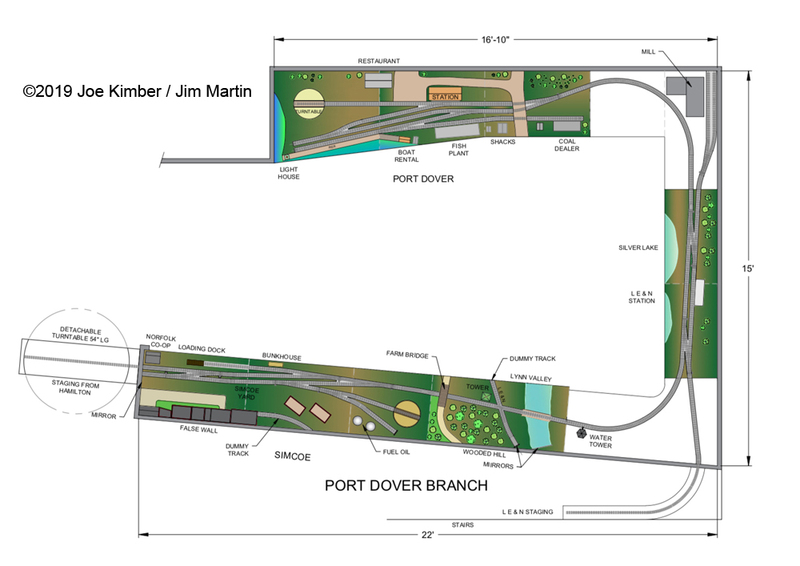 The old layout consisted of Port Dover, Culverhouse, Silver Lake, a 180 degree curve, Lynn Valley and Simcoe. The new arrangement is Port Dover, a 90 degree curve, Silver Lake, a 95 degree curve, Lynn Valley and Simcoe. I have lost a few sidings in the process. Culverhouse is gone, of course - as is the switchback from the Port Rowan branch exiting Simcoe. 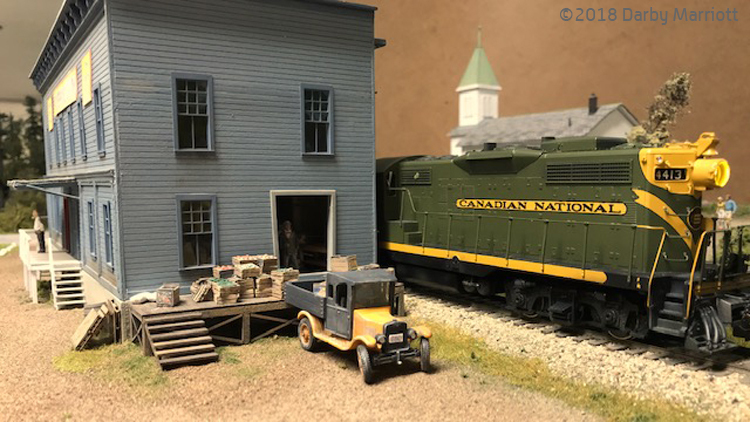 For the sake of simplicity what was to be the old Port Rowan branch does not pierce the backdrop as originally planned so I lost the room for a switchback. Instead the track is truncated to become a fuel depot siding. 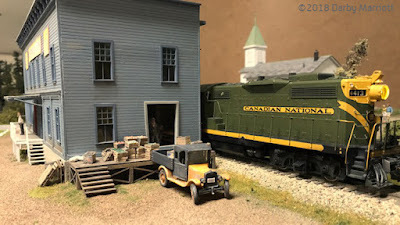 To make up for those losses I will be adding another #6 switch at the Silver Lake depot and will run a couple of tracks to a large mill structure in the corner. This is freelance so I have not yet decided what sort of mill it will be. For the time being, I’m naming it Sumkiynda Mill. 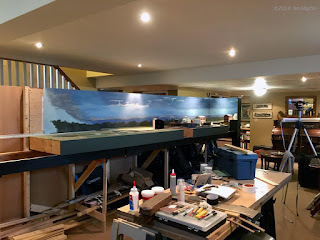 I also have to construct the staging shelf for the Lake Erie and Northern and run the track through the backdrop to the Silver Lake depot. 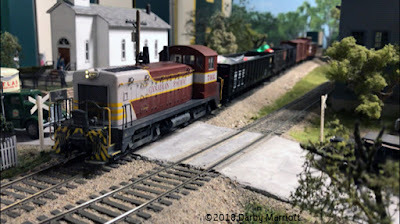 It was necessary to swing the #8 switch behind the Port Dover coal yard toward the backdrop in order to widen the curve leading to Silver Lake. The curves in both corners, each approximately of three-foot radius, have been super-elevated. 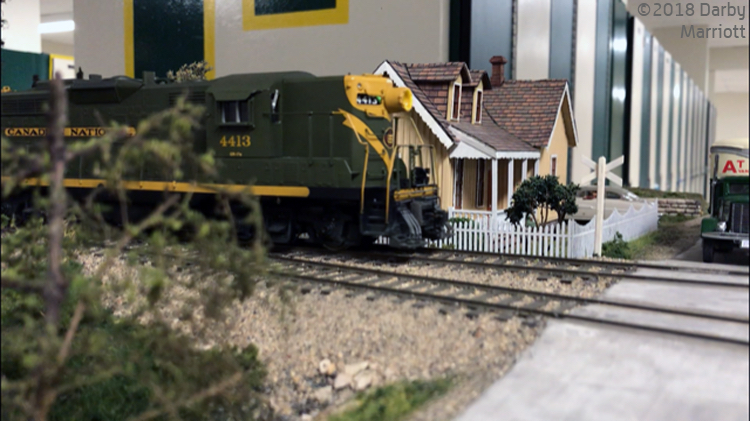 A couple of dummy tracks will play scenic roles. One is the LE&N track crossing the CNR at Lynn Valley. The other will be a spur at Simcoe that simply vanishes behind some buildings. 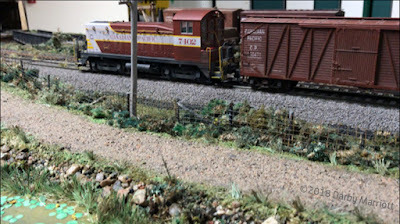 I will also be trying to find room for a dummy freight track (not yet illustrated) at the LE&N station at Silver Lake. There may be room for a turnout that would make it functional, but not if it has to be shoehorned in. Why a 95 degree curve in the one corner? That was necessary to swing Simcoe out and away from the basement stairs to allow access to storage and the rooms beyond. I’m pleased at the ways things are progressing. I’ve been able to reuse almost the entire layout along with most of the backdrops and lumber that supported it. The only real money I’ve had to shell out has been for the false wall behind Simcoe and a new section of aluminum backdrop. There is much more I could write about but I’ll save that for future visits. At least then, you the reader will have a notion of what I’m describing. 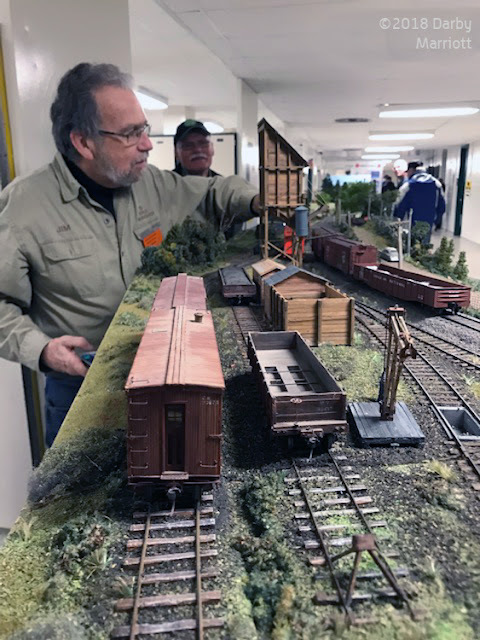 The Quinte Model Railroad Show is becoming something of an annual tradition for our group: The show is a favourable location for our eastern Ontario members - and it's not too distant for those members in Toronto and the Niagara Region. This year, the Workshop crew on site included myself, Paul Raham, John Johnston, and Darby Marriott. Being Christmastime, this is a show where we let our hair down a little. 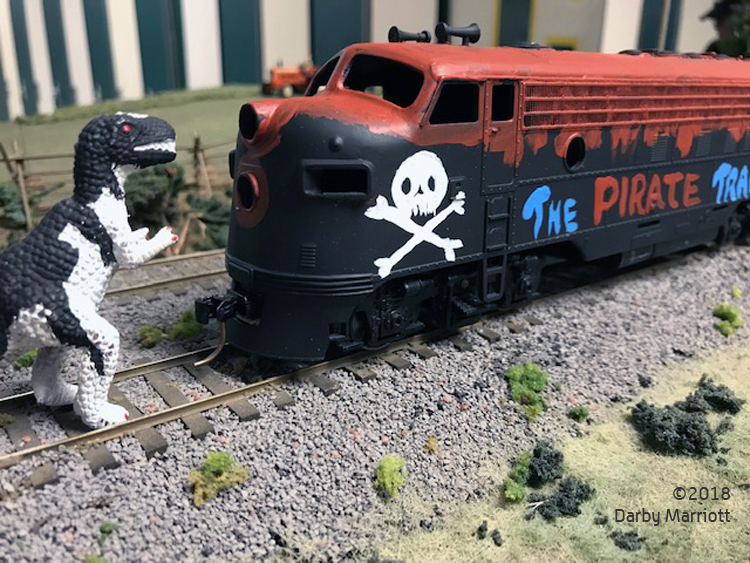 An elephant grazes in Paul’s pasture, my Stegosaurus and Bovasaurus Rex roam the layout, there are candy cargos in the hopper cars, and John ran a pirate train for his grandson Decker. Paul, John, Darby and I enjoyed hanging out with each other and roaming the exhibition halls for bargains and inspiration. Thanks also to Workshop friend Daniel McConnachie for helping out Saturday, and to honorary S-scaler Dennis Rowe for his ongoing encouragement. Incidentally, this was Darby’s first chance to participate with a module. My Culverhouse module now belongs to Darby and I can’t wait to see how he makes it his own. That process has already started in how he packages it for travel. He has imagineered a clever little arched toboggan under one end of the module which makes sliding it into his car a breeze: So simple and effective. 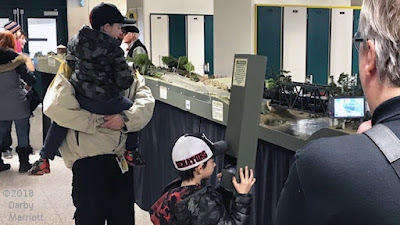 Currently we are not sure if we have nailed down our appearance at the next Copetown Train Show (February 24, 2019: 10am-3pm) but we’ll keep you posted. In the meantime we hope you enjoy Darby’s photos from the weekend. Work progresses on fitting my Port Dover layout into its new home - although depending on when one visits, it can look like two steps back. 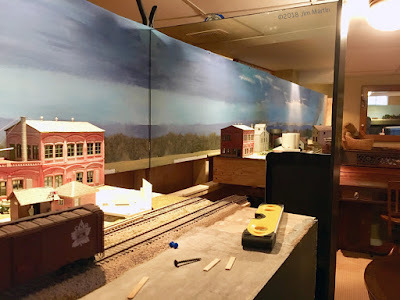 Currently it’s in the “two steps back” stage as a number of layout sections have been pulled back off their “L” girders to facilitate a few necessary jobs. 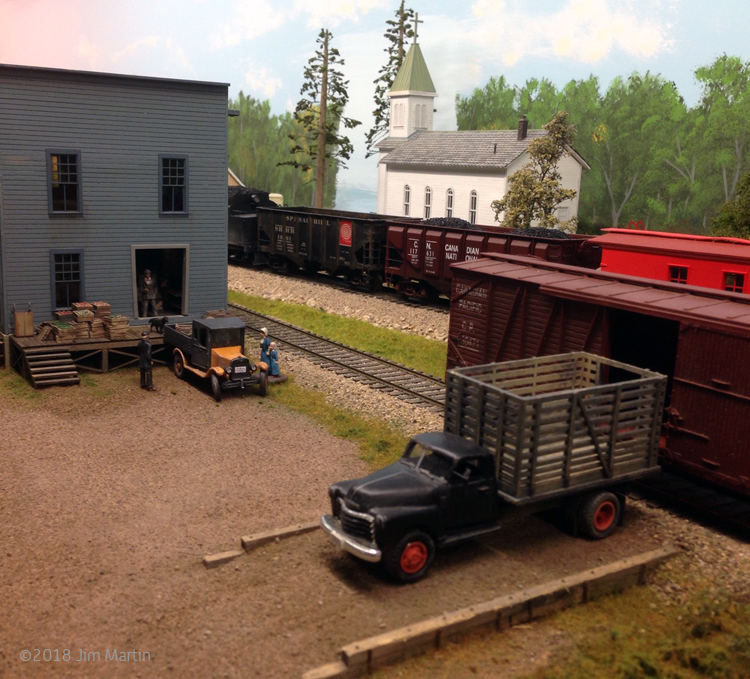 Jim's layout in its new home. As he's reported earlier on this site, the new space is much more comfortable. One job involved lifting the whole layout ever so slightly to better meet the bottom of the backdrop. Some three-quarter inch strapping on top of the girders took care of that. I am also fitting the last of three backdrop sections. Once these jobs are done and dusted I expect the sections to be permanently installed so I can get cracking on track and scenery. 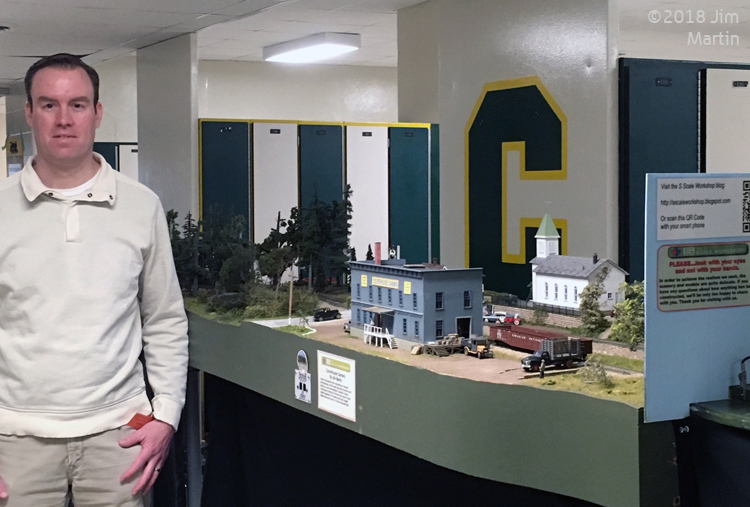 Jim's Culverhouse module has been a popular feature on Workshop exhibition layouts. With a new owner, it'll be back on the exhibition circuit. A few months back I mentioned opting for a slightly smaller layout. Something had to give and it’s my Culverhouse module. Ironically, Culverhouse is the most scenically complete of anything I have done so far, but it had to go. I’m happy to tell you its new owner is fellow Workshop member Darby Marriott. Sadly I repurposed its portable legs and carry cradle when I thought it would be permanently retired to the basement, so Darby has to recreate those pieces. Darby shows off his legs. Darby’s already hard at it prepping his new module for the annual Quinte Model Railroad Show in Belleville, Ontario - December 1 & 2. I’ll be there, along with Darby, Andy, John and Paul. We all hope you'll drop in to say hello!